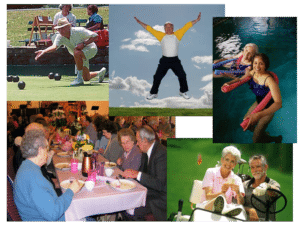 Friendly Valley Country Club is Santa Clarita’s premier senior living communities for those aged 55+ at an affordable price, consisting of exclusive resort-style amenities not offered at any other senior community in the Valley. Retirement doesn’t have to be boring, and that’s why this senior golf community offers a quiet, peaceful place to live while also offering a wide array of activities for those who aren’t ready to slow down. Since it’s establishment in 1963, Friendly Valley has gone through extensive upgrades and expanses over the years to keep up with growing demands of retirees. Sprawling over 200 acres nestled within the hills and surrounded by oak trees, Friendly Valley is the most relaxing and fun place to retire. The community is conveniently located within miles to the 14 freeway or just around the corner from the Metrolink station. Shopping, dining, and grocery stores are all located right outside the gates. Take a quick trip down the road to get to Placerita Canyon – home to some of Santa Clarita’s best hiking spots. If you feel like getting out of the Valley and exploring what else our area has to offer, the San Fernando Valley is just a quick 20 minute drive away and Downtown Los Angeles can be reached in no time. The community consists of a gated security entrance, 24/7 staff, and 1,290 condominiums ranging from one bedroom / one bathroom, to three bedroom / two bathroom with laundry area and two-car garage. Larger units offer a rear patio with small garden area. Prices range from the low $100,000’s to the mid $600,000’s. The HOA fees cover services such as cable TV for each home, trash and recycling pick-up, RV parking, access to travel and social clubs, upkeep for community landscaping, maintenance to units and common areas, fire and earthquake insurance, and 24 hour security. Community amenities are almost too many to name! We offer a free tram service for residents to travel within 5 miles of the community, large auditorium for shows or banquets, a fireside lounge with television, library, business office, security office, and fitness center. The Multipurpose Building includes rooms for activities such as billiards, cards and games, arts and crafts, conferences, or meetings. The Annex Room includes tables and chairs, a kitchen, AV equipment, and a piano, making it the perfect place to host a party. Are you more of an outdoor person? The Olympic sized pool and hot tub / spa is open year round. There are also adjacent men’s and women’s locker rooms and showers. We offer outdoor activities such as shuffle board, a lawn bowl court, horse shoes, and a picnic area with access to a BBQ. Enjoy a round of golf on either our executive 9-hole course, or 18-hole pitch and putt course, and end the day by relaxing in the golf lounge. Enjoy participating in events and over 40 members-only clubs involving exercise, theater, arts and crafts, gardening, and games, just to name a few. There will always be something you’ll love to do at Friendly Valley. We encourage our residents to involve their friends and family in our community. Guest parking and special pool hours for children are available. Invite your visitors over to experience all the fun that we have to offer. Friendly Valley Country Club really is the place to experience the ultimate in luxury living without having to experience the high prices that usually comes with it. Our amenities are like no other that you can find around.